Rejoice it’s pancake day, and may I say it’s always greeted with much gusto and enthusiasm. I’ll admit I’m rubbish at tossing a pancake, it gets stuck on, the cat, or the ceiling or in the pan, I opt for a spatula or let my husband do it. However I do make a pretty mean American pancake, or drop scone, or whatever the heck you want to call them. This year has seen an added challenge. Mini me is ( temporarily I’m hoping) having to avoid both gluten and dairy, as well as nuts. So can you make a delicious dairy free pancake? Oh yes you can- and here’s how I do it. 1-2tbs caster sugar or 1-2tsp maple syrup. 140mls milk of choice ( I used rice milk for the dairy free version). I added chocolate chips ( from Moo Free) but blueberries or just plain work well as well. Mix all the ingredients together to form a batter. Fold in the chocolate chips. I use a Tefel pancake pan with no oil. Pour some batter in, when it starts to show air bubbles it’s time to flip and cook the other side. There you have it, super easy and great for pancake day. For my third Blogmas post I’m sharing a recipe, (well sort or recipe) with you. The lovely people over at Naturelly were challenging people to create a layered jar. I took the challenge and my mango layered pot was the finished result, so far, I’m working on a truly Christmas twist for my next one. If you have never heard of Naturelly they produce fabulous jelly/ juice pouches for children. Nut free, gluten free, dairy free and 36 calories so great for little ones- but who says the kids should have all the fun? I’ve given them a grown up twist. Anyway the best thing with these jars are they are quick and so easy to make ( or assemble really). They would be so cute on a Christmas morning breakfast table, all prepared so the all important family time and present unwrapping isn’t interrupted. Win win all round. I can’t really call it a recipe but here goes any way. The method is simple, layer up how you fancy. I chose mango, yoghurt, granola, mango then naturelly. The next step is simple- dive in and enjoy your breakfast. Do you like layered jars? What’s your favourite flavour? Let me know in the comments below. Disclaimer: I was sent the naturelly to create a recipe, all views and ideas are my own. I know what your thinking, it’s not the potato kind, but the lovely, douse me in ice cream or maple syrup kind. 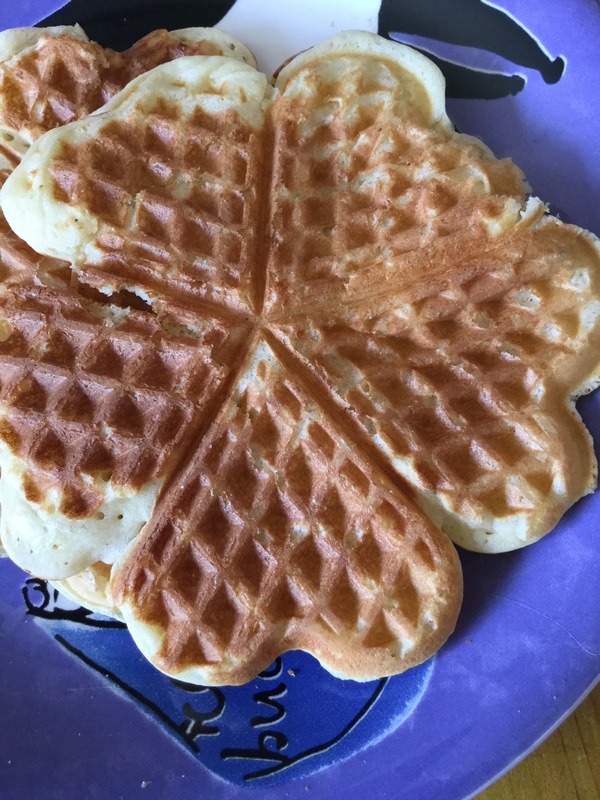 The long story short is that we purchased a ( sort of tacky) waffle iron in the sale and munchkin then kept on and on until I made some. They are delicious, the downside is that mini me now demands them a lot. This is ok and they are so easy to make, and easily adapted to suit a lot of diets. Cover with whatever you fancy and enjoy. What is your favourite waffle topping? Let me know in the comments below. Hello, hello, hello I’m back ( or BT has finally fixed our phone line). anyway now normal service can be resumed and I’ve got loads of posts to share with you all, so I best get started. 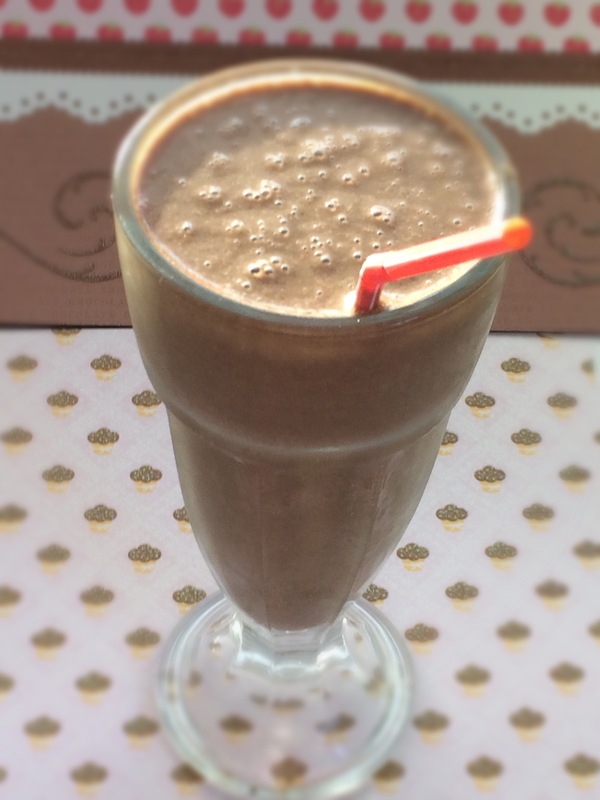 This here Is a green smoothie in disguise. 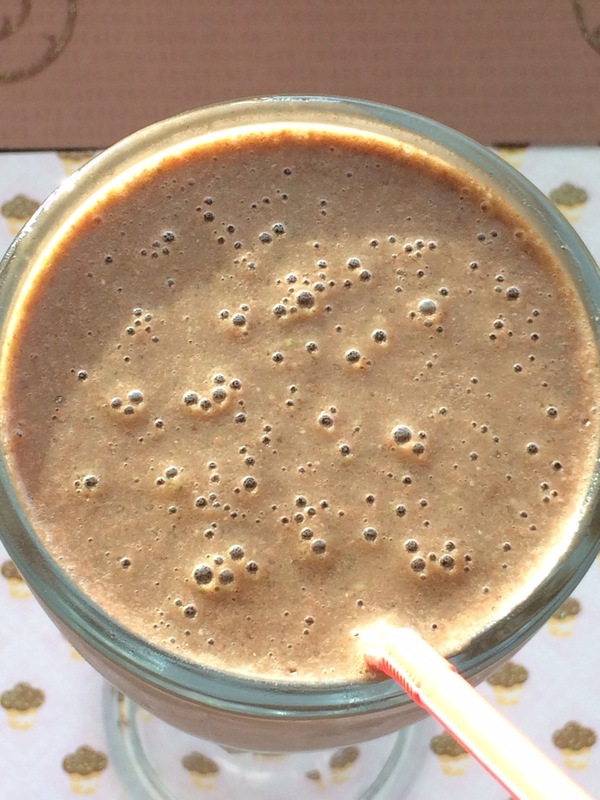 It’s perfect for a chocolate fix but has less sugar than some of the other smoothie combinations out there. I’m not going to say it’s clean, or sugar free etc, sugar is sugar whichever way you look at it, and this has some fruit in. Right back to it I’m experimenting with photo backdrops and have some pictures to take. ( it’s one of my aims this year to improve my photography skills). Hmmm so how’s 2017 going for everyone? Not bad for us this end, although losing a dear friend has been a blow. However this is not a post intended on depressing you all, on the contrary the year is still young, opportunities are a plenty and my popcorn machine is on standby for me to pull up my chair and watch the comedy/ horror/ disaster movie that is Trump ( I’m childish and still snigger at his name) going into the Oval Office. I’m sorry, I’m sorry I’m supposed to be keeping you all uplifted, well you will need energy to do this…..and this breakfast is perfect for that. 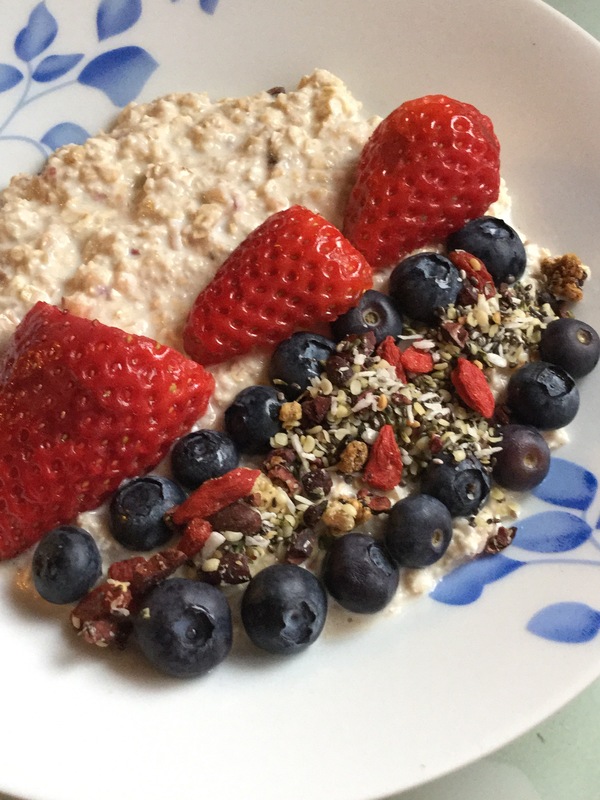 I love ( gluten free) oats, they are filling, good for you, and versatile. What’s not to like? The best thing about over night oats is that there is no right or wrong way to eat them, any flavour or combination work, they can be as clean ( or dirty??) as you want them to be, and can be made the night before. This is the real winner for me, as it saves precious time on that early morning rush…. Mix the oats, milk, yoghurt, chia and sweetner together and leave for 6-8 hours in the fridge. In the morning add to a jar ( or bowl) and have fun with your toppings. 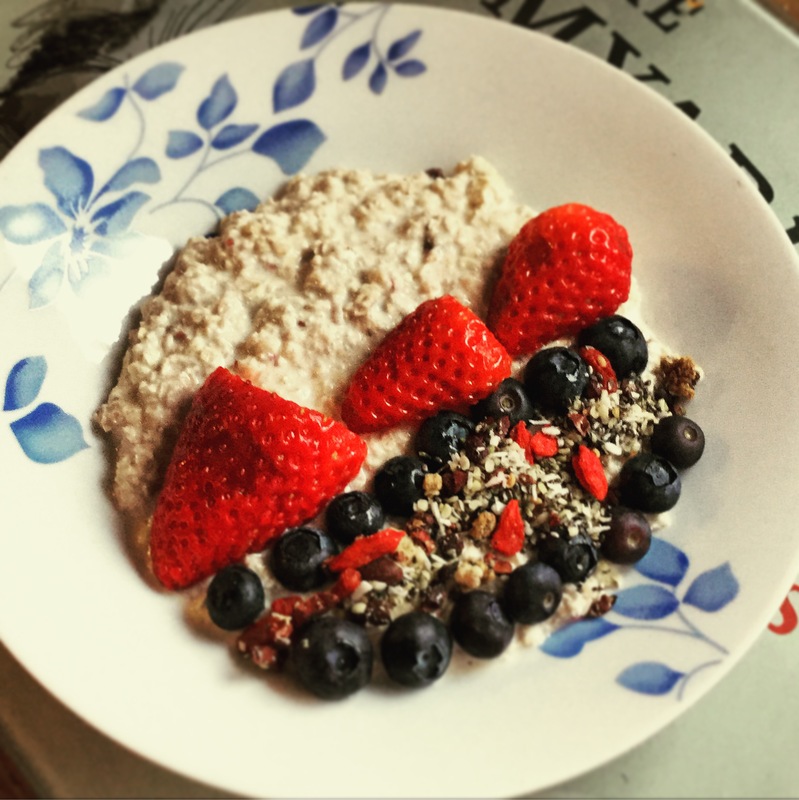 Have you tried over night oats? What’s your favourite flavour combinations? Let me know in the comments below. I know I’ve been a little quiet this week, wedding prep has been taking over, but I’m back and raring to go. 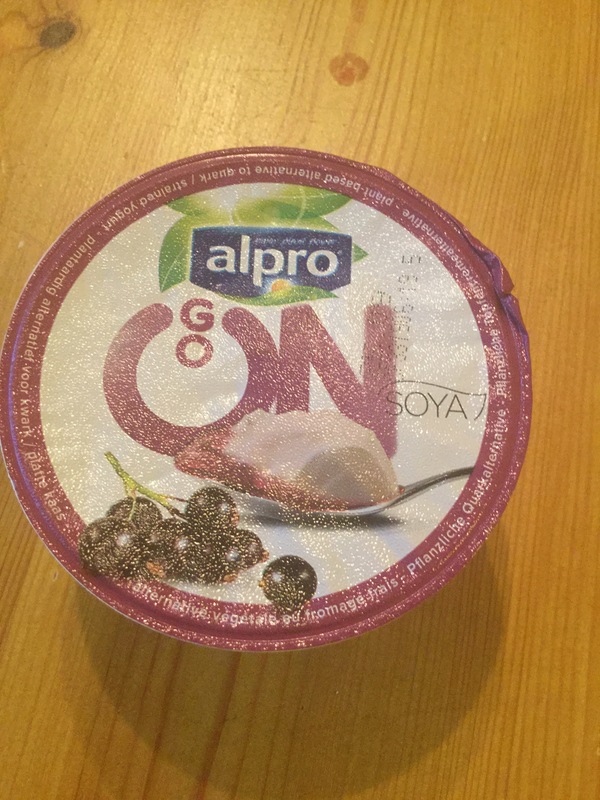 And speaking of raring to go, this new yoghurt alternative from Alpro is great for an on the go breakfast, or mid morning snack. Now I was skeptical, I hate ( with a passion) soya lattes, I much prefer coconut based products taste wise, but I’ll not knock something until I’ve tried it, so Off to waitrose I toddled to pick a pot up. I went for Blackcurrant, but mango or Passionfruit are your other 2 flavour options. The pots are single annd around 85p each. I should point out these Are both gluten and dairy free and suitable for vegans and vegetarians, they do however have a “may contain” for tree nuts in the allergen list. Anyway how does it taste, I was really impressed. 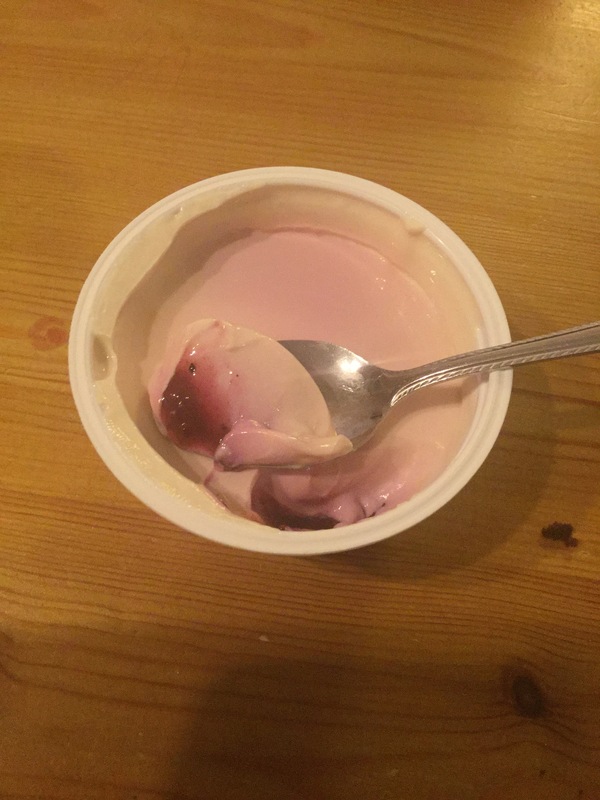 The yoghurt is thick and creamy, with a silky texture. There was a good layer of both fruit and yoghurt. The tangy sensation from the Blackcurrant was delicious, and not too sweet or sickly. Another bonus is that these pots are high in protein, which may have helped keep the hunger pangs at bay . I’ll definitely be trying the other flavours. These pots have restored my faith in soya products- some are really delicious. Have you tried these new products? If so let me know your thoughts in the comments below. Disclaimer: I was sent a voucher for a pot to sample. All thoughts and opinion are my own, and honest. It’s fair to say that this year has seen the launch of a whole host of new free from products. I’m not complaining, more choice is always a good thing. 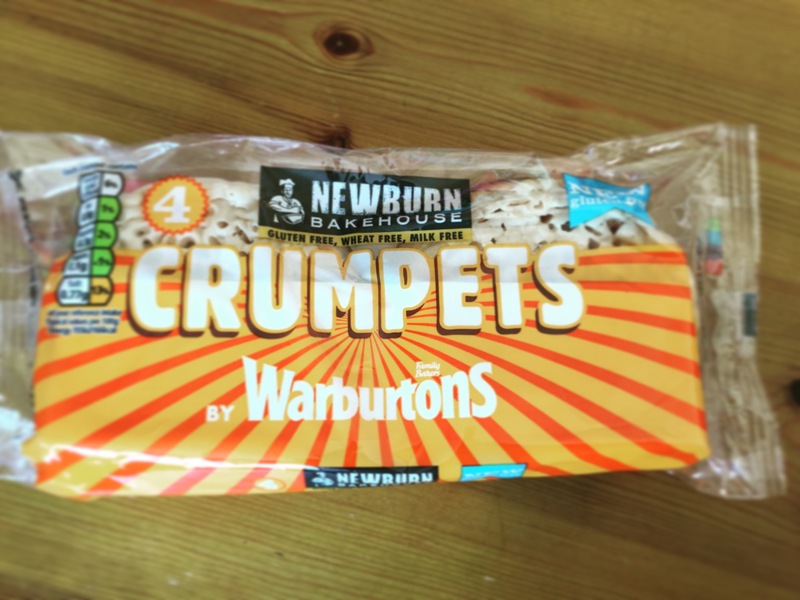 I was quite excited to hear the Newburn BakeHouse ( the gluten free side of Warburtons) were launching a new crumpet. 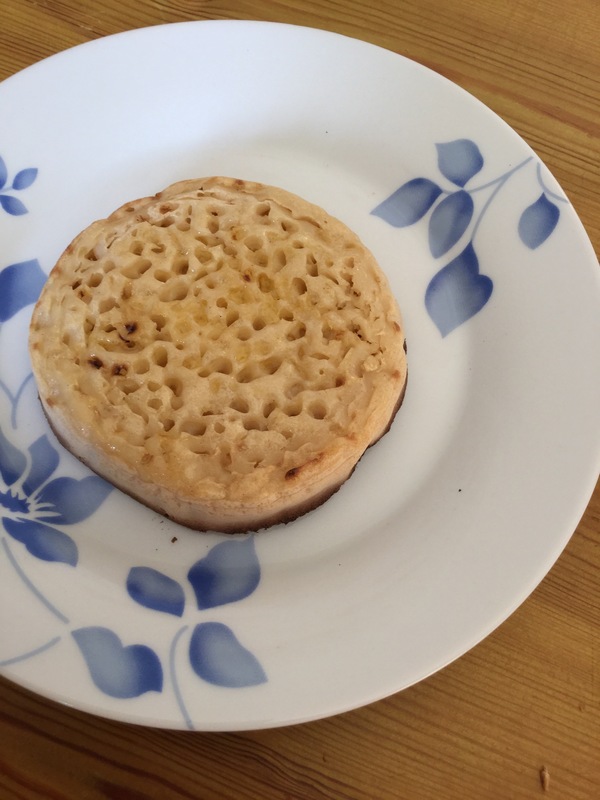 Now along with trying to perfect my own, I’m not there yet but bear with me, the other crumpets out there are M&S (horrid) and Genius ( taste ok but funny texture) so I was wondering what are these going to be like. I mean in my head the bar was fairly high as I love Newburns artisan loaves so I’d assumed these would be the same high standard. The texture is very similar to their ordinary crumpets, and they toasted well, I personally like my crumpet crispy ( no puns please) so double toasted it, and went old school with just butter on. They are hands down the best I’ve tasted. They are like actually proper crumpets, no crumbly texture or stodgy mass but a proper tasty breakfast or teatime treat. My only fault is they are expensive £2 for 4 crumpets but it’s matched with genius and given the choice between the two I’d be picking these. So would I buy them again- too right but I’ll be hiding them from the other half or he’d scoff them all in an instant. I should add they are available from Tesco and Sainsburys stores. Disclaimer: I purchased these myself, all views are my own and honest. Parfait what’s not to like right? Whether it’s the frozen dessert or layered up in a pot I think it’s great. I’ve become a fan of mason jars or jam jars and they are great for providing a vessel to transport your breakfast. And what could be better than one of these pots of joy?? Anyway I digress a bit. 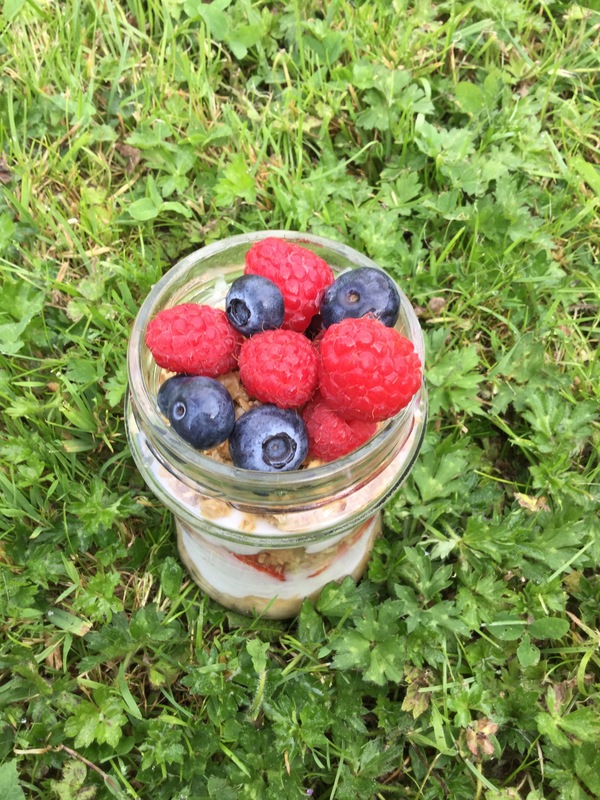 I’ve all these fresh berries and it’s hot ( yippee) so parfait pots made for a great, healthy breakfast. Perfect for summer. The method is easy, banana at the bottom, and then layer up however you fancy. Then dive in with a spoon and enjoy. Do you like parfait? What’s your favourite flavour combination? Let me know in the comments below.